Chaiseri Metal & Rubber Co.,Ltd. A manufacturer of rubber and rubber-to-metal bonded parts, rubber bumpers, and torque rods, for the Royal Thai Army and armies in many countries. 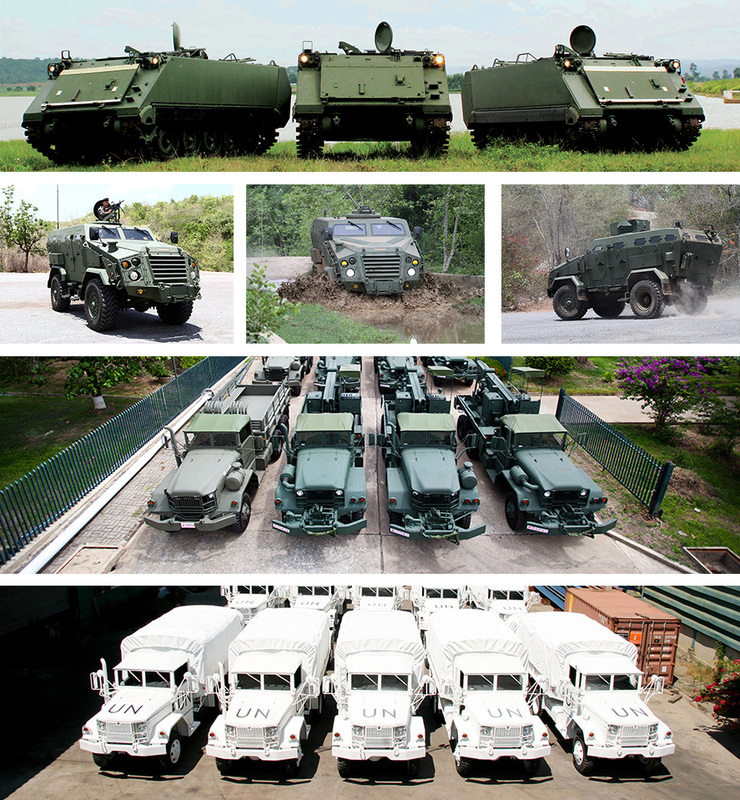 It is also a provider of repair services for military trucks and vehicle armors and a supplier of Thai-manufactured armored vehicles. To manufacture quality military products for the defense industry in order to strengthen Thailand’s national security. The military of Thailand and many countries across the world are strengthened by quality military weapons, manufactured with premium materials and designed with advanced innovations for various purposes. Chaiseri Metal & Rubber Co., Ltd., a defense company, is behind the military security of many countries. The company is not only a manufacturer, but also a designer and developer of products. With an ultimate purpose of defense security, Chaiseri invents both internal and external systems for military units and related national security agencies. It offers a wide range of products, such as continuous tracks, tank wheels, rubber-to-metal bonded parts, belt joints, and torque rods. The company also provides repair services for military truck as well as vehicle armors, and supplies Thai-manufactured armored vehicles. Chaiseri has been trusted by the Ministry of Defense, the government, and relevant agencies. T Mark had an opportunity to talk with Ms. Nopparat Koolhiran, Vice President and Manager of foreign affairs of Chaiseri Metal & Rubber Co., Ltd., who shared with us the company’s journey from the beginning to the current success. From a family business in the production of rubber and rubber-to-metal bonded parts for commercial cargo trucks such as rubber bumpers and torque rods, Chaiseri and its reputation had been recognized for its excellence in efficiency before it added values to its products by developing and expanding its capability to cover the production of internal parts for armored vehicles. Importantly, the company still maintains its uniqueness of using Thai rubber, inventing and improving its own rubber formula to be suitable for various purposes. 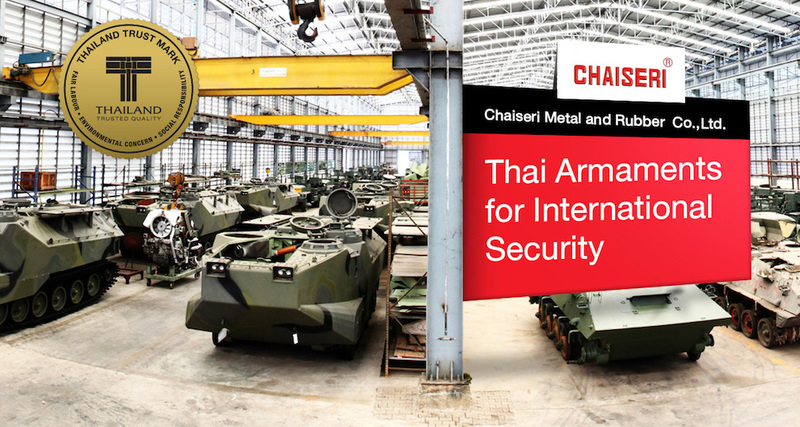 Back in 1968, Chaiseri had an opportunity to provide repair services for the Royal Thai Army’s imported armored vehicles. With this experience, it could identify the weaknesses of each imported model and realized that efficiency standards were not met. For example, only the doors of the tanks were explosion-resistant, but under the tanks were not. A lot of vibration could be felt when the tanks were running, the ill-designed wheels could damaged roads, and loud engines made them easily traced. Therefore, Chaiseri started its products’ development to solve these problems by using Thai materials. This was a key milestone which never stops Chaiseri to develop its armaments to meet the highest standards. Currently, Chaiseri has developed armored vehicles which go beyond limitations and increased other capabilities, for example, running on a road at a fast speed, evading clashes, being automatically driven in an efficient manner, the same ability to make a turn as normal cars, two vehicles being able to run in opposite directions on a narrow lane, changing from 170-horsepower engines to 300-horsepower engines, and internal parts being interchangeable with those of other vehicles such as ships. Chaiseri has developed 200,000 MIII3 APCs, by redesigning the model to eradicate tracks on the road surface. Hence, this model can run without any trace, making it more difficult to identify its location. Chaiseri’s products have been continually tested for quality. The company has standardized laboratories to strictly inspect the quality of each part as armaments concern lives of the users. Failure to ensure standards may lead to unexpected damages. For example, adding heat-resistant substance to enable the vehicles to run in high temperature areas such as a desert. Normally, rubber from other manufacturers is melted and not resistant to heat at 50 degree Celsius. But Chaiseri’s rubber is problem-free as its equipment is tested for quality and efficiency before it is actually manufactured. What’s more, Chaiseri showcases its products in international defense exhibitions every year, such as Eurosatory, the world’s largest international land and airland defense and security exhibition; and IDEX: International Defense Exhibition & Conference, making the company internationally recognized. Its customers include armies, defense attaché, ministers and policy makers of countries who pay attention to new innovations continuously offered by Chaiseri. With these experiences and trustworthiness, Ms. Nopparat Koolhiran has been invited as a speaker who shares knowledge on the weapons procurement of many countries. She also performs as a guest lecturer at many Thai institutions. Chaiseri has been quality-certified by many institutions, such as Prime Minister’s Export Award in 2006 and 2007, Design Excellence Award (Denmark) in 2011, and Thailand Trust Mark, which help to ensure its products’ quality and high confidence among buyers, and guarantee that Chaiseri has never stopped developing its innovations.